This card was issued on 4 January 1940 to commemorate Stamp Day. 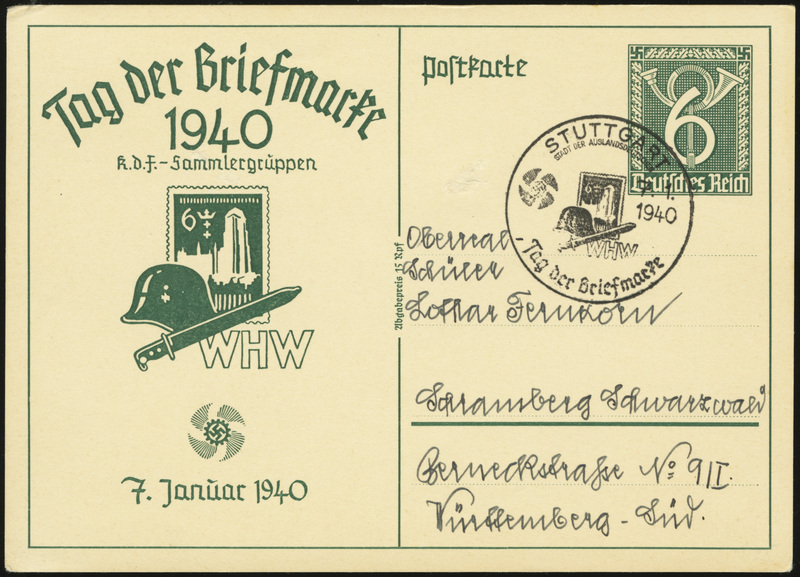 The left side of the card is inscribed “Tag der Briefmarken / 1940 / K.d.F.-Sammlergrüppen” (Stamp day / 1940 / KdF Stamp Collectors Association). 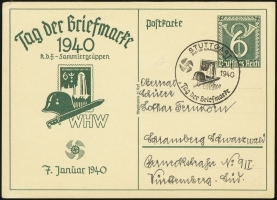 It also features a design incorporating the 6 Pf Reintegration of Danzig issue (MiNr 714) behind a helmet and bayonet, with the letters WHW (Winterhilfswerk). At the bottom is the KdF emblem and the date “7 Janüar 1940”. A card of RdP (Reich Philatelic Association) design (P289) was issued the same day, also in commemoration of Stamp Day. A commemorative cancel depicting a the same design was available from 6-7 January 1940.